Are you a green tea fan? I’ve been cutting back on coffee lately. I find it rather acidic on my stomach, and in my old age, it now makes me jittery (true story). But on mornings that I need a little pick-me-up, I love a warm cup of green tea. We all know that green tea has antioxidant benefits. But did you know that powdered green tea – also known as matcha – has 137 times more antioxidants than brewed green tea? Friends, that’s a lot of antioxidants. And we all know antioxidants are important because they fight cancer-causing free radicals in the body (among other benefits). Plus, can we just talk about how delicious matcha powder is mixed with coconut milk and a little maple syrup? Hello afternoon green tea latte bliss. Have you tried a smoothie bowl yet? It’s a fun way to slow down and enjoy your smoothie as more of a meal with a spoon (as opposed to slurping it down with a straw). Plus, you get to add more nutritious foods with toppings like fruit, nuts, and seeds. I hope you all love my 4-ingredient, 5-minute take on the matcha green smoothie! 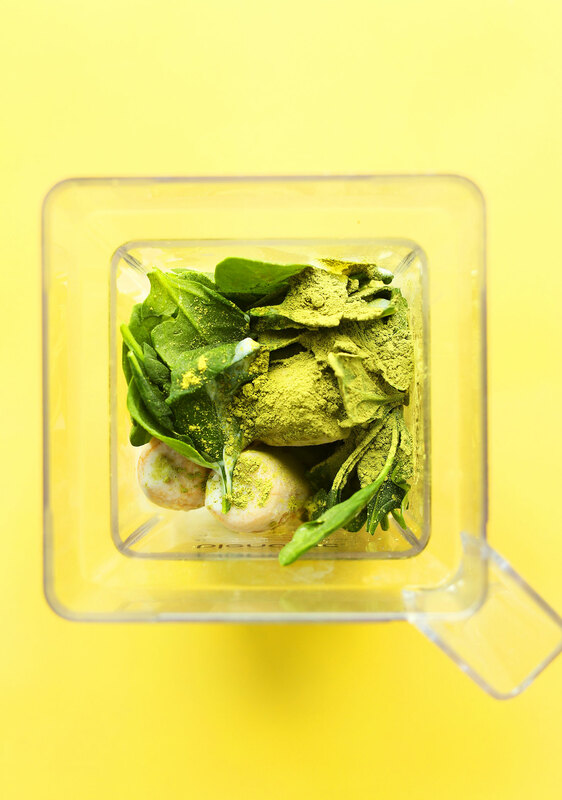 Banana creates a creamy, sweet base; coconut milk adds creaminess and complements the green tea flavor; and the matcha powder adds mega health benefits and an earthy, tea flavor. Pineapple is an optional ingredient that balances the sweetness with a bit of tartness. If you give this recipe a try, let us know! Leave a comment, rate it, and don’t forget to tag a picture #minimalistbaker on Instagram. We’d love to see what you come up with! Cheers, friends. 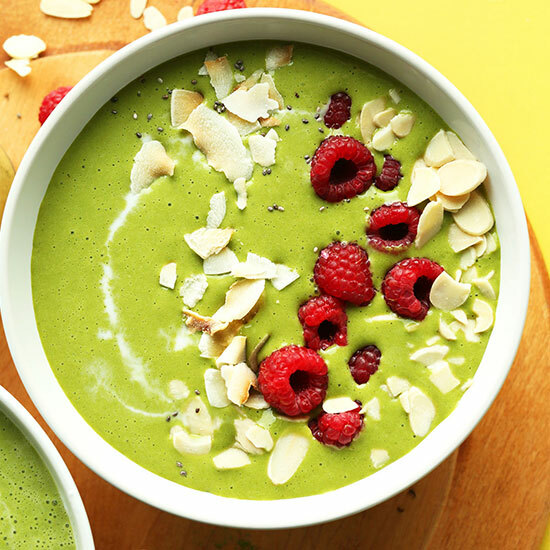 Quick, 4-ingredient green smoothie bowl infused with matcha green tea powder! Creamy, naturally sweet, and just as healthy as it is delicious! 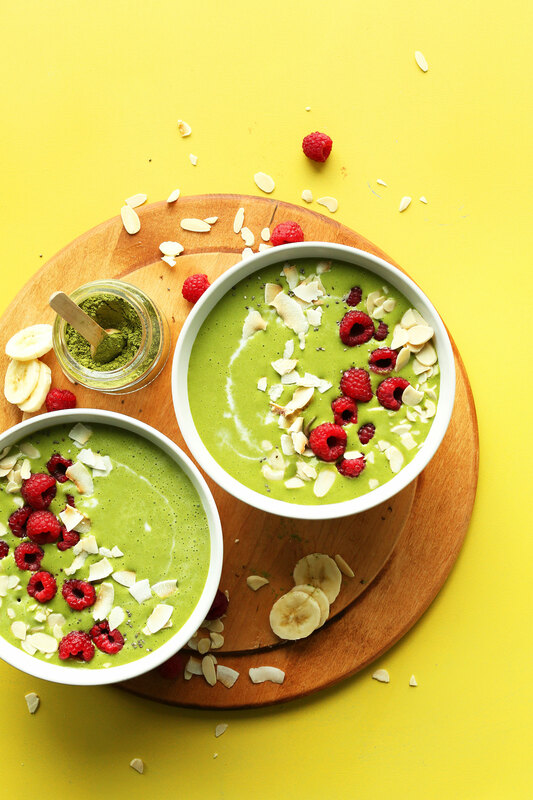 Add frozen banana slices, pineapple (optional), lesser amount of coconut milk (3/4 cup or 180 ml as original recipe is written // adjust if altering batch size), matcha powder, and spinach to a blender and blend on high until creamy and smooth. Add only as much coconut milk as you need to help it blend. In my opinion, you want this smoothie somewhere between scoopable and drinkable. Taste and adjust flavor as needed, adding more banana (or a touch of maple syrup or stevia) for sweetness, matcha for more intense green tea flavor, or coconut milk for creaminess (though adding more matcha powder adds more caffeine, so use your best discretion). Pineapple will add a little tart/tang, so add more if desired. Divide between two serving bowls (amount as original recipe is written // adjust if altering batch size) and top with desired toppings (optional). I went with fresh raspberries, chia seeds, and coconut flake. Bananas would make a delicious garnish as well. *Thin with water instead of coconut milk to save on calories, if desired. 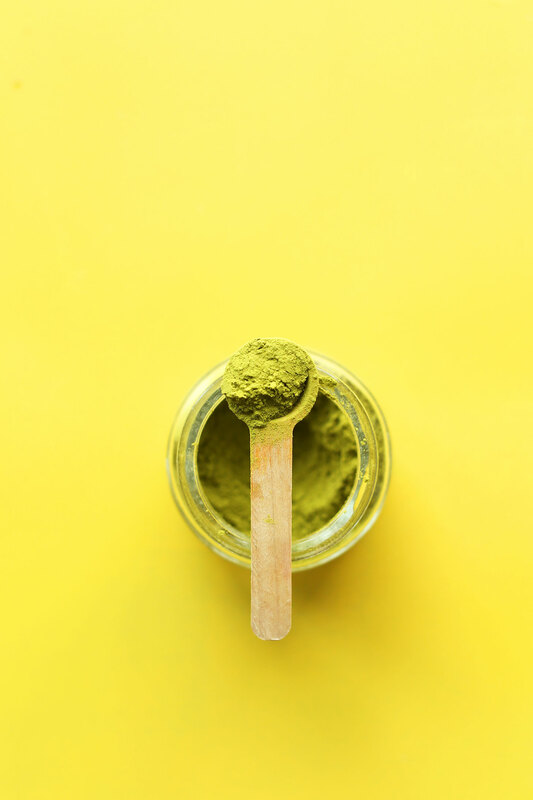 *For a full review of available matcha powders, check out this fantastic article from Lunch Box Bunch! Hi is there any thing else instead of bananas to make it creamy cause i’m allergic to them. Sadly. Just add ice in place of bananas! To achieve a creamy texture, you could also use avocado, but we haven’t tried with this recipe. Great way to start the mornings. I add lemon and/ or cinnamon, sometimes subbing almond milk or simple water w p-btr. But can we talk about reliable sources for matcha? Is it only grown and produced in Japan? Any problem with powder mixed with brown rice bran? Thanks for a great site!!! We are glad you enjoyed this to start off your day, Kathleen! When it comes to matcha, there are many different grades you can purchase. We really like this brand, and would recommend it! Did I mention? You are a genius. This is so good. I topped with your rawnola and blueberries~ yummm! Every recipe of yours are just spot on! Thank you! This was delicious! My husband makes smoothies in the morning and rushes out the door but this version did slow us down and give us time to enjoy it calmly. The coconut milk can be a significant percentage of saturated fat, but if the rest of your meals for the day are low in saturated fat, then you’d be right on the mark. I didn’t add the pineapple this time but still enjoyed it a lot. Thanks! Made this for my wife and I this morning and it’s fabulous. I’m going to try it with green bananas on heavy training days to try to up the resistant starch. Thanks for a great, easy recipe. Hi! I have a banana allergy, but this looks so good! Any ideas on what I could sub for the banana? Would a mango be weird? Maybe just up the ice? So, I tried it with a mango and it doesn’t taste quite as good. I’d recommend using frozen coconut milk ice cubes like in this frappuccino and sub matcha for coffee! Thanks for the idea. I haven’t had a smoothie in ages. I used half an avocado in place of one banana and thought it was the perfect sweetness with the pineapple. Love your recipes! You haven’t read the study behind the claim that matcha has 137 times the anti-oxidants. That number came from comparing the green tea with the lowest amounts of antioxidants they tested to the specific brand of matcha they tested. Compared to the brand of green tea with the highest that they tested, matcha only had 3x as much. So, really, the 137 number is a highly misleading marketing ploy to trick people into thinking matcha is way better than it really is. Matcha is still better, but not to the degree you claim in your article. I am with matchamiracles.com and I would love to post links to some of your recipes on my site if that is okay with you? Hi! I think I have developed a slight intolerance to bananas and was wondering what you would recommend to substitute in it’s place. I want to try giving my body a break for a little bit. Thank you so much! Love this recipe! Where do you get your cute wooden spoons/jars you use for your chia puddings and whatnot? I’m going to have to try all of these recipes. They all sound yummy. …and I have a pretty big bag of Matcha sitting in my kitchen cabinet going to waste! U totally forgot about it! I know, bad. Thank you for this list of recipes! DO IT! Hope you love it, Michelle! Wow. Such an amazing recipe. I just made this and am in love! By the way. I love your photography in your posts. What kind of maple syrup do you use/buy? Thanks! The smoothie is so lovely for summer. Thanks! Your book just came in the mail today!!! So excited!!! Yay! Thanks for the love. Hope you enjoy it, Cait! This is lovely, tasty and super easy to make! I have a question about the coconut milk. I’m frequently confused about what the difference is between the coconut milk in the carton (usually in the “milk” section) and the different varieties of coconut milk in the cans – lite or otherwise – found frequently in the Thai food area or specialty cooking areas in the grocery stores where I live. I’d love to know which you use for the recipe for the best results. I currently use the “carton” version. Thanks. Hi there! Carton coconut milk is definitely thinner – canned is thicker. I always use light coconut milk in a can! Delicious and perfect for hot summer mornings–it’s like eating green tea ice cream for breakfast. I love adding macadamia nuts and even wheetabix. Used vanilla matcha, and it’s one of the best smoothies I’ve ever had! I put pineapple as well. Great smoothie! I’m enjoying one now. I will be making this refreshing treat often in the summer months. Another success, Dana! So kind! Thanks for sharing! I just tried this recipe this past weekend. I LOVED it. I substituted the pineapple with mango and I was v happy! So as I can see, there is a big “wow” for matcha lately – both in my industry and around Vegans. Shame to say, I’ve never tried it yet! Thank you so much for sharing the amazon link, because I was very unsure about which one I should get (limited reviews on each one). Wow, this smoothie looks totally delicious! Gotta try this! Yes! Tastes delicious, love this combination of ingredients. Nice one. Wanna check this out. Ingredients sounds new to me ?Will get u my reciew back soon. This looks absolutely delicious! 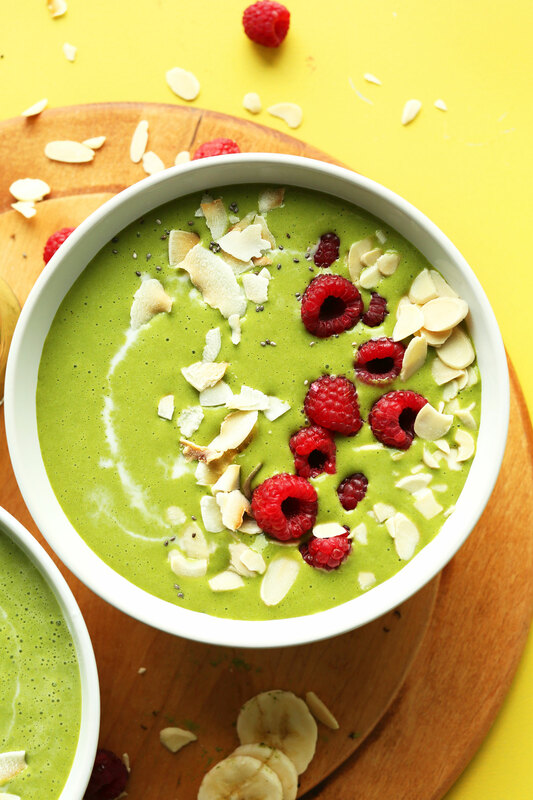 I love matcha smoothie bowls! Yum! I’ve been adding matcha to all of my smoothies (this morning with mango and coconut shreds). Coconut milk is a great idea! I’ve yet to create and post something using matcha but your delicious looking smoothie bowl has definitely inspired me. Could you substitute almond milk or would the consistency be way off? Pretty! I like to use Matcha Maiden’s green tea powder in my matcha smoothies. this looks beautiful Dana! I totally laughed at the whole old age and getting jittery comment because I totally relate, I cut out the coffee at the beginning of the year because it started to make me feel awful and shaky but it is SO worth it! I feel so much better without having it… after you get over the whole detoxing of it LOL which lasted about a month! but seriously your energy is going to thank you for cutting back on it! I actually have all these ingredients on hand! Yay! Is this to thick to drink through a straw? Not at all! Adjust thickness with more or less almond or coconut milk. Thanks for introducing me to Matcha!! Always learning great things from you!! I had to start brewing 1/2 caffinated + 1/2 decaffinated coffee to keep from getting over caffinated! Also, if you add a pinch of baking soda to a cup of coffee – it takes out the acidity! Just telling you for when you “really” need a cup of coffee!! CONGRATULATIONS ON YOUR COOK BOOK! That’s CRAZY! I’ll have to try that! Thanks, Auntie! First, please give organic coffee a try before giving it up completely if you don’t already, and find conventional coffee irritating. Second, I recently thought about drinking matcha just because, not necessarily considering quitting coffee, but I would if I liked matcha better. Then I contacted my local, organic tea shoppe to see if he had it. He gave a simple answer: NOT SINCE FUKUSHIMA. I then began a quest to find matcha certified not to contain radiation. Rishi Tea ty told my buddy at Whole Foods that they test three times. That’s all well and good, but it’s not ceremonial grade, and I would prefer it. Please let me know if you all know more than I. This looks amazing! Thank you for adding a link to Amazon, I have been searching everywhere for Matcha powder! I cannot wait to try this, beautiful pictures. I’ve never actually used matcha green tea before but that’s a lot of antioxidants to pass up. So I’m definitely picking some up the next time I spot it. I think it adds some tartness to balance the sweetness of the banana. Hope you love it! Sounds and looks delish! I’ve had a maca smoothie bowl but I guess this would be different…they look very similar. Will have to try! This sounds SO GOOD! I can’t wait to make it. YES. Let me know how it goes! This bowl makes my heart happy, you have no idea. I am simply addicted to matcha. Nice! You’ll love this bowl then. Let me know if you give it a go! I only recently discovered matcha, feels like I have a lot of catching up to do! This sounds delicious! I’m kind of obsessed with all things matcha at the moment so this is perfect! I’d eat it for that colour only *_* Who cares about the taste! I’m with you, I had to give up coffee. It was killing my stomach. It’s been almost a year now and I’m totally fine with out it. I just drink tea every day now. David loves matcha but I only think it’s “okay”. I’d love to try it in a smoothie though! Whoa! I had no idea about the matcha and its antioxidant benefits. Woke up last night thinking I was having a heart attack, I honestly think it’s the caffeine. My wife has been nagging me to stop drinking it and to please eat healthier as I’m only 36. I workout but find diet is just as important as what you eat. Making this asap!!!! In a smoothie matcha is awesome! I like it even better shaken with almond milk, an ice cube, and a little sweetener! Hi! What sweetener do you use for this? Hi! You can use stevia. Be careful with Stevia if you have a ragweed allergy – they are from the same family. My boyfriend was literally aggravating his allergies daily and having dry, cracked, bleeding itchy skin because he put Stevia on his cereal daily. He stopped, and literally his skin calmed down within two days. I’m interested on how much matcha you combine with how much milk and an ice cube to make a sub for morning coffee, please. And any other ways to make a quick beverage using matcha. I’m new to Matcha and not good at guessing. Looking forward to trying the above recipe for a matcha smoothie or bowl. Thank you for your help.